Thousands of organizations are modernizing their application portfolios, and we are helping them on their journey. We work with you to build an Application Modernization Factory (AMF), providing advisory consulting, program governance, and application lifecycle expertise – all cultivated from best practices developed with the world’s largest organizations. We partner with your teams to accelerate the assessment, prioritization, and redesign of legacy apps, quantifying the economic value of change and providing a roadmap for delivery. We work with you through the modernization efforts of redevelopment, consolidation, and optimization, harnessing patterns and technologies such as agile and DevOps, microservices, cloud computing, and MongoDB best practices. The Application Modernization Factory is an iterative process which consists of two cycles - a portfolio assessment cycle which looks at application portfolio groupings, and an execution cycle which performs the actual migration. Assess and Understand: Assess a portfolio of applications based on dimensions of technical fit, business criticality and an organization’s drivers for change. High-scoring applications are further analyzed and a high-level design and estimation of effort is constructed for re-platforming on MongoDB. This is then reported back to the relevant application owners for a go/no-go decision. Execute: If approved for re-platforming, a deep-dive re-design of the selected applications is developed, along with implementation, testing and deployment support. The assessment and prioritization of modernization activities is a critical component of a successful Application Modernization program. 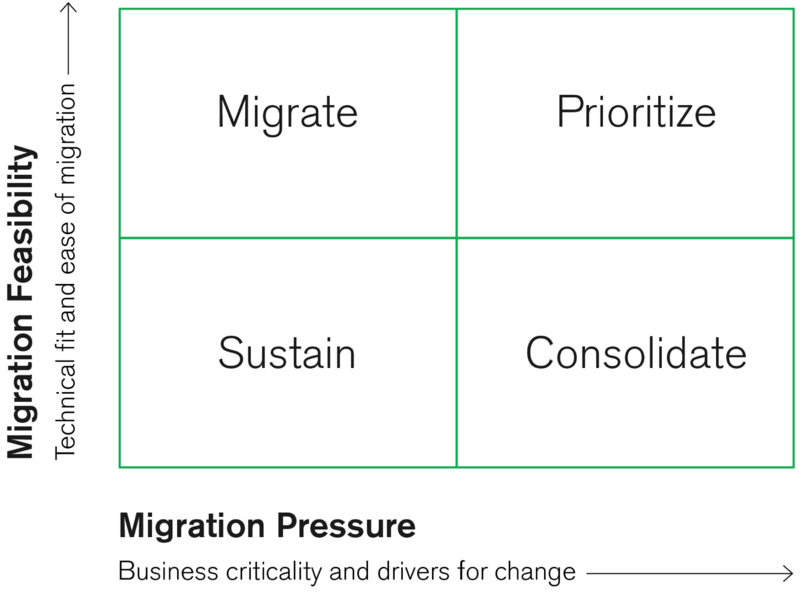 From many customer engagements MongoDB has found that two distinct dimensions need to be considered to produce an optimal assessment: Migration Feasibility and Migration Pressure. This is an assessment of an application’s technical fit for MongoDB compared to its current platform, along with a measure of the ease of such a migration. Factors such as application and data architecture, the development environment, and operational factors are considered to produce a relative measurement of the application’s suitability for modernization. Nobody migrates an application that is working well – there needs to be a business advantage to justify committing resources to a refactor or rewrite. In this stage, we look for high-profile issues impacting the business that a modernized stack would address.